The Duel frameless tub door lends a modern look to any bathroom with its square hardware accents and gorgeous chrome frame finish. Ideal for your bathroom renovation project. Fits tub showers with 55 1/2 in. wall clearance, glass extends to 59 in. Tub walls can be a good economical solution to your renovation needs. Installation is quick and easy. They're practical, affordable, and look good. The white high gloss finish on the walls is low maintenance and simply wipes clean with a soft washcloth. The design on the one-piece tub wall will enhance the area around your tub with the look of ceramic tile. The long shelf and three soap dishes gives you plenty of storage for your toiletries. Your bathroom makeover will be done in a snap! Tub walls can be a good economical solution to your renovation needs. Installation is quick and easy. They're practical, affordable, and look good. The white high gloss finish on the walls is low maintenance and simply wipes clean with a soft washcloth. The design on the 5-piece tub wall will enhance the area around your tub with the look of ceramic tile. The long shelf and three soap dishes gives you plenty of storage for your toiletries. Your bathroom makeover will be done in a snap! The Halo is a luxury glass door that slides smoothly and silently along award-winning MAAX ball bearing technology. A stainless steel rail system and waterproof magnetic closer ensure tip-of-the-finger ease at all times with this frameless wonder. It features 8 mm tempered glass, 78-3/4 inch high glass panels, reversible opening - left or right for ease of installation and a massive 15 inch handle that is sleek and comfortable to use. Renovate your bathroom with style; and accentuate your ceramic decor with the MAAX Halo door. Tall and frameless, this 2-panel shower door has a modern and silent roller system making it an easy to open. Its massive door handle is sleek and comfortable to use. The reversible door for left or right opening installation is a great feature for ease of installation. 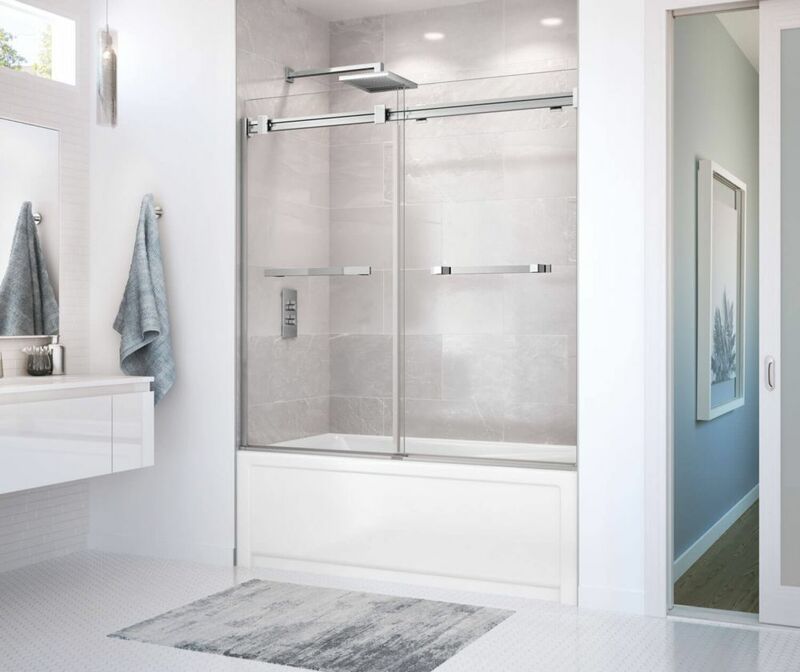 Duel Frameless Sliding Tub Door 56 to 59 Inch x 55.5 Inch Chrome The Duel frameless tub door lends a modern look to any bathroom with its square hardware accents and gorgeous chrome frame finish. Ideal for your bathroom renovation project. Duel Frameless Sliding Tub Door 56 to 59 Inch x 55.5 Inch Chrome is rated 5.0 out of 5 by 2. Rated 5 out of 5 by A4away from Works and fits perfectly Replaced shower curtain and what a difference. Makes bathroom look so much bigger and there is no splash. I would recommend a professional for installation - only a few hundred dollars and NO frustrations. Rated 5 out of 5 by RJRR from Looks great, works great. Purchased and installed two of these for our bath tubs. Installation was straight forward. It took me about 4 hours each to install. The frameless looks great. This product indicates it is available through online purchase yet the add to cart button is not active and does not allow purchase. Is it available? I recently purchased on-line for delivery to Calgary SE.